Platelets are essential for blood clotting and are formed in the bone marrow by large cells, so-called “megakaryocytes”, which form long protrusions that penetrate into blood vessels, where the shear forces of the blood stream detach small pieces, which form the platelets. Low platelet numbers can be caused by different diseases or can be the result of an inherited disorder that leaves megakaryocytes unable to produce platelets. These heritable diseases are of clinical importance since low platelet numbers can cause excessive bleeding, which can create severe complications for instance during surgery. A better understanding which factors regulate platelet production is therefore needed to develop new treatments for platelets deficiencies. Recently, mutations in a gene called “Gfi1b” have been identified in patients with a bleeding disorder caused by low platelet numbers. 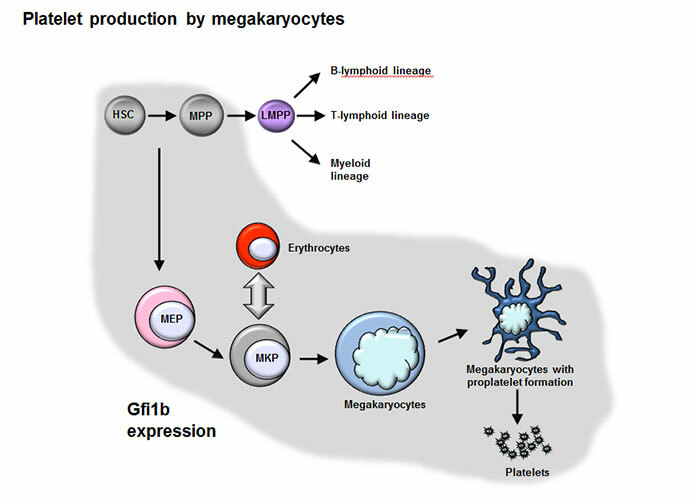 We have generated mice deficient for this gene and have observed that they show most of the typical symptoms of the human disease associated with the mutated Gfi1b, suggesting that the Gfi1b gene is a critical element in platelet formation. We propose therefore to investigate how this gene functions and regulates platelet formation to gain new insight how to treat patients with bleeding disorders and platelet deficiencies.